Central Asia, also sometimes known as Middle Asia or Inner Asia, is a region in Asia east of the Caspian Sea, west of China, north of Afghanistan, and south of Russia. Historically Central Asia has been closely tied to its nomadic peoples and the Silk Road, once important trade routes across the Asian continent. The region was and is again a crossroad for the movement of people, goods, and ideas between Europe, Western Asia, South Asia, and East Asia. West of the Caspian Sea lies the Caucasus, a mountainous region that comprises of southeastern Russia (Northern Caucasus), Armenia, Azerbaijan (including disputed Nagorno-Karabakh region) and Georgia (South Caucasus). 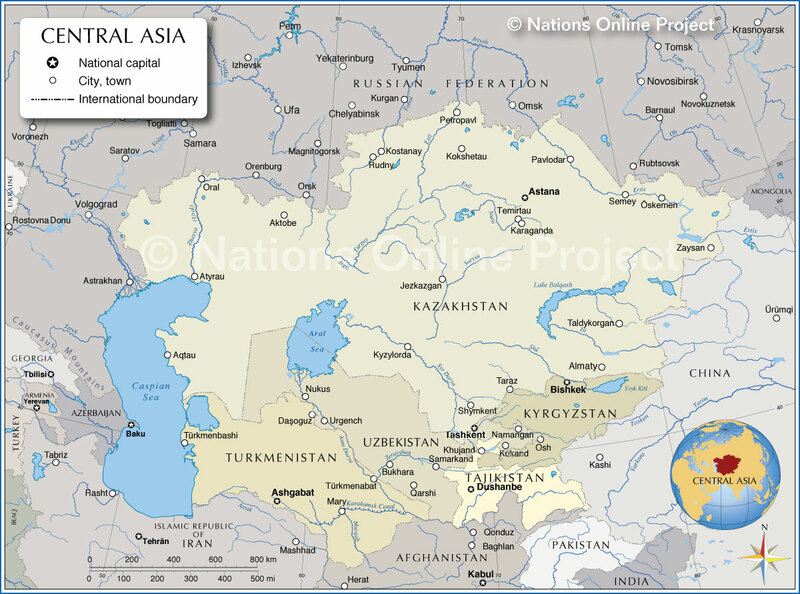 Clickable map of countries in Central Asia and the Caucasus region. Click on a country name to get to the country profile page, or use the links below. Country maps will be found obelow this map. Map showing the Countries of Central Asia and adjacent countries with borders, capitals and main cities. Aktobe (a major city at the the Ilek River and capital of Aktobe Region), Almaty (Kazakhstan's former capital and larget city), Aktau (the country's main port on the Caspian Sea), Atyrau, Jezkazgan (Zhezkazgan), Karaganda (Qaraghandy, once Kazakhstan's second-largest city), Kokshetau, Kostanay, Kyzylorda, Oral, Öskemen, Pavlodar, Petropavl, Rudny, Semey, Shymkent, Taldykorgan (Taldyqorghan), Taraz, Temirtau, Zaysan. Countries of Asia with population figures.